The case for extending education and professional development to our schools’ security officers. 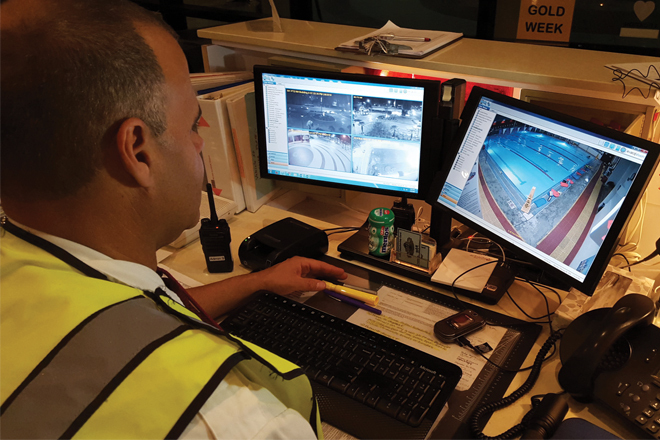 Above: Monitoring de Toledo High School's CCTV system. All photos courtesy of de Toledo High School. We educate our students. We provide professional development to our faculty and staff. What about our security officers? A critical common denominator among all independent schools is our emphasis on educating children in a caring and nurturing environment. 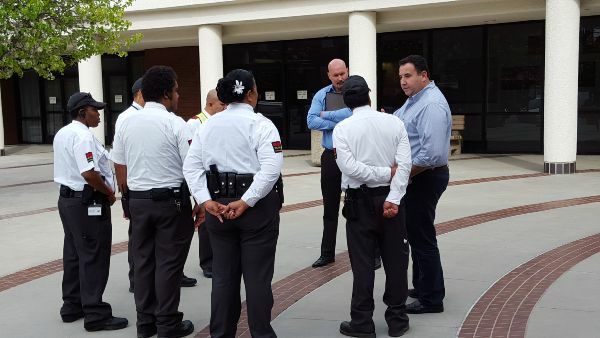 At de Toledo High School, we extend that emphasis to the security officers who keep our campus community safe. We want them to truly care about their jobs, and we invest in them by providing training and demonstrating that we, in turn, care for them. Security is very important to our school, maybe more so than others. A primary reason is that we are a Jewish school, and Jewish schools tend to face more security threats than others. Another reason is the unfortunate increase in mass shootings in schools by unstable individuals. We are always staffed by enough security professionals to ensure that all our access points are well covered. The bigger impetus came from a study we commissioned five years ago to evaluate the need for armed security guards. That study revealed an average police response time of five minutes for an emergency situation — and that’s for the third-largest police force in the nation. Should there be an active shooter situation, it could be all over by the time the first police car arrived. We decided we couldn’t afford to take that chance and added highly trained armed guards to our staff. Ensure our faculty know our guards. Feature photos of our guards on the school’s internal and public-facing websites. Write about them in emails and newsletters. Invite them to school events. Include them in (and explain the purpose of) annual giving requests. Treat them to occasional lunches. Provide them with school spirit wear. utility belts, flashlights, radios, personal first aid supplies, tourniquets). In addition, we pay for our armed officers’ memberships at target ranges. We encourage them to go on their free time and provide them with ammunition to practice. We also invite non-armed officers to the range if they express an interest in safe shooting. Has the skills, experience and training to accomplish his or her tasks. Knows how to communicate with others. Can get people to take desired actions without physical contact. Notices subtle changes in the environment. Is versatile and able to multitask. Knows how to give and take orders. Is a visual deterrent against crime. Is flexible enough to stand post, act as a rover, patrol, supervise and work in a variety of environments. Doesn’t resort to weapons or physical restraint unless absolutely necessary. Can distinguish between an observation s/he can dismiss and one to report to management. Receives up-to-date training on the latest security techniques, policies and procedures in accordance with best practices. Is self-motivated to keep his or her clients safe and secure. Knows how to write a professional report. Represents the company and client to the same high standard. Thinks like an adversary in order to detect threat early on. Our second emphasis is training. From a selfish point of view, we’re getting better-prepared officers whose more refined skills will go farther in protecting our school community. From the caring perspective we’re giving our officers more professional opportunities than they’ll get at most workplaces, advancing their professional value, their wages and hopefully their self-worth. Training is especially critical for our armed guards, who must be capable mentally and physically for their job at our school. To that end, we require, support and pay for them to train with their weapon on a quarterly basis at a minimum. Our models are first-responders and military organizations. Often when these individuals are not in service or actively engaged, they are training and training and training. When they tire of training, they do more. We make it clear to our guards that if they want a job where they walk the fence or check receipts at a store, we are the wrong place. If they want to perform security in a diverse environment, we welcome them and will assist in their growth. Here is some of the on-the-job training our guards receive. It ranges from formal training to group gatherings that last 15 to 30 minutes. Proactive threat-assessment training: Required of all new officers and repeated as needed. Advanced security: Use of batons, handcuffs, pepper spray (special-use permits may be required). Mandatory target range training: Armed guards complete with trainer four times a year. CCTV control: How to maximize the camera system in different situations, review older footage, document for reports. Incident report-writing: What to include; writing and spelling tips. Customer service: Who our school is, why this job is important, why it is important to be friendly and polite. Communications and de-escalation: Crucial, especially when a situation is escalating. Traffic control: Training via outside professionals. Defensive security: How to handle potential knife attacks. School calendar: For instance, the importance of admissions season, what happens at dances and graduation, etc. Local and world events: What is happening in our community/world that may prompt a change in our security for the day or week? Great security officers cost money, but I believe they are the best investment a school can make in its security program. I encourage other NBOA members to contact me if they would like to discuss this matter or share their own approaches. David Marcus is campus business manager at de Toledo High School, a Los Angeles-area day school with 400 students in grades 9-12. See the NBOA library for his guidance on employing versus outsourcing security personnel.